The 23rd Annual Invitational Miniature Show at the Germanton Gallery opens this coming weekend December 5th and runs through Jan 10th, 2016. I have two new paintings in the show. 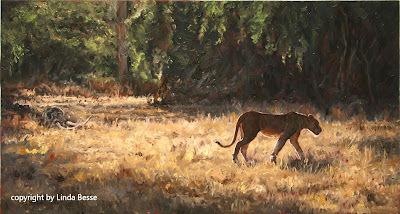 When thinking on what to paint for a piece which is 108 square inches or less, I thought to have a North American subject and one African. The first one was inspired by last February's trip to Massachusetts in the middle of their "big winter." 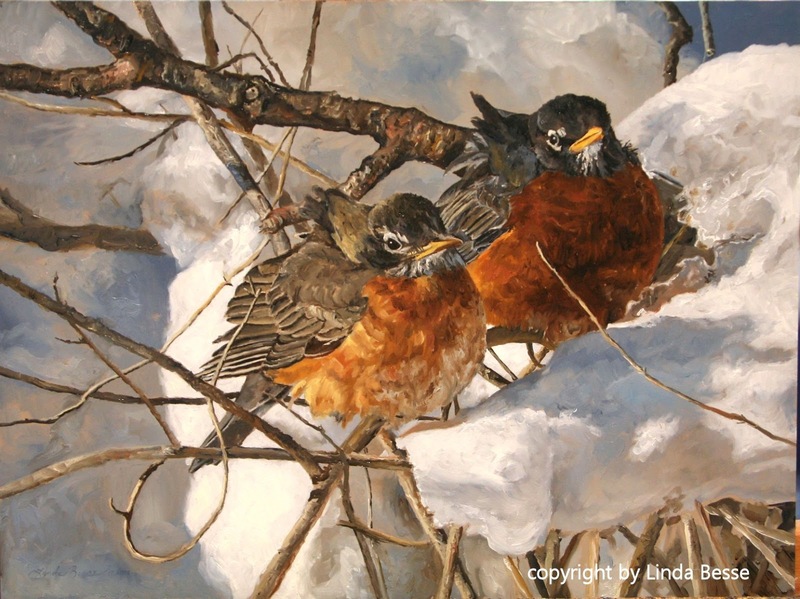 Outside my parents' door were more than a dozen robins huddled, flying, and landing in the bushes and vines. The light was beautiful. The second piece is more from my imagination. I wanted to try and capture one of those silent places in Africa where maybe no human has ever set foot. Light becomes second nature to us in this world of electricity. Not until power is taken away do we realize how much we rely upon it. On Tuesday, eastern Washington State experienced what they have dubbed an "historic" windstorm. We lost power about 5:30 pm. When we learned the extent of the damage in town, we knew we would be without power for quite a while. That also means no water. With a well powered by electricity, one's living conditions certainly change. I found myself walking into a darkened room and hitting the light switch. Wanting to see better, I didn't think, I just did. I expected the light to be there. It wasn't. 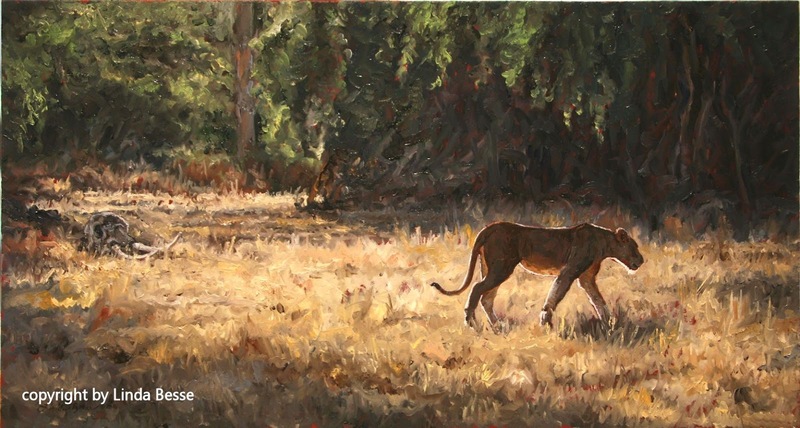 If I might stretch an analogy, I wonder how many times I work on a painting and expect the light to be there. I don't make a conscious effort to create the light in the piece. Maybe I think my subconscious will just make it happen. Sometimes that is true. And other times I need to spend some time to make sure the light I see in the scene in my head is translated into paint. In the piece below, I was thinking about how I could convey that gorgeous light on snow. I started with a tan colored gesso to give an underlying warmth. The snow has a lot of warm blues and I pushed the color around to give a softness to the background. The "white" is titanium white with a little cadmium orange and cadmium yellow deep. 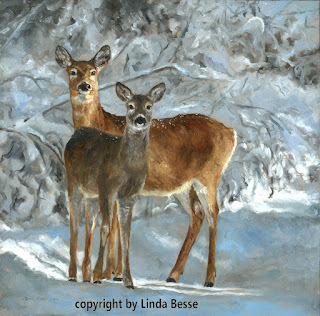 Even though a whitetail deer's coat turns gray in the winter, with just the right light on her, she can glow a stunning orange-y brown. The shadow on the young deer in the foreground keeps his coat gray. Surprisingly, our power, and hence our lights, returned this afternoon. We were prepared for longer but are grateful to return to the light. For a time, I will think about losing power every time I flip a switch - until having light will once again become second nature. I hope I never take the light in my paintings for granted and I will strive on each and every piece to keep the lights on. This saying aptly applies to this next painting. After working on a large piece, I wanted to do something small, really small. Stripes and spots are the most difficult to do at a miniature scale so rather than work on one zebra, how about FIVE. The large caribou painting (see previous blog) was drying on my easel so I used my small table easel and a wonderful 5 diopter LED magnifying lamp from Global Industrial. Without it, the painting would have been even more difficult. 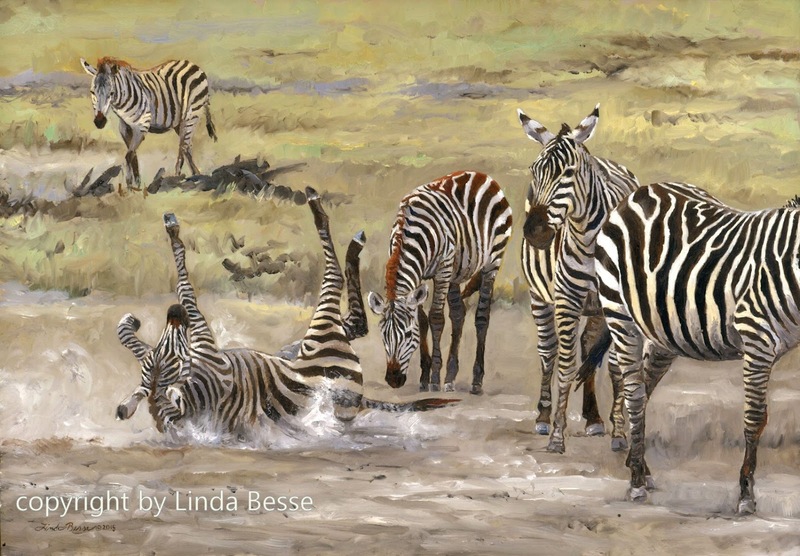 There were times I wondered what possessed me to have 5 zebras in a painting less than 1/2 a square foot. Trying to figure out if I was working on a white or black stripe and the subtleties of shading at this size made the piece especially challenging. 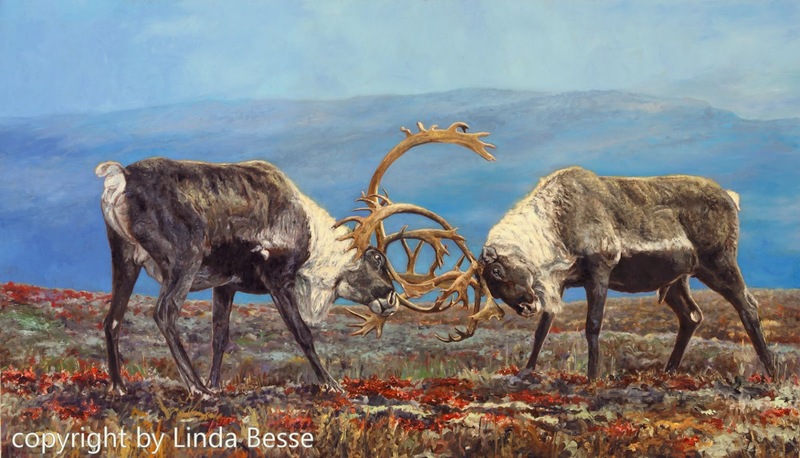 This painting is at Pacific Flyway Gallery & Framing for their Holiday Miniature Show. A number of changes have been made to the painting since my last post. 1.) the mountains have a dip on the right hand side. It makes the scene feel more intimate to me and clearly defines the ridge as mountains, not some darker sky. 4.) "red" glazed on for the ground cover (my favorite bit) I used barium red and burnt sienna along with some cadmium red, cadmium orange, and titanium white. Liquin was the medium. 5.) foreground grasses. I continued some of the warm colors of the antlers into this section. Still, I wanted to keep it loose so not to draw your attention away from the action.